Chapter 2: Megaliths − what are they? Here we will discuss what megaliths are, what they are like, how they are constructed, where they are located, and whether they are oriented towards corners of the earth. We will start with dolmens (Figures 2.1 – 2.5). These constructions remind toy houses which children often build in a sandbox using boards or flat stones, with that only difference, that the weight of some of such stones reaches tens of tons. The biggest of the slabs seen by me, was a dolmen’s roof in a small village Crucuno (Figure 2.4). It weighs about 30-35 tons. The blocks used at their construction usually do not have any traces of processing or adjustments at installation. Therefore, the dolmen walls have so many big cracks, that it is not clear whether they are walls or only supports for roof slabs. 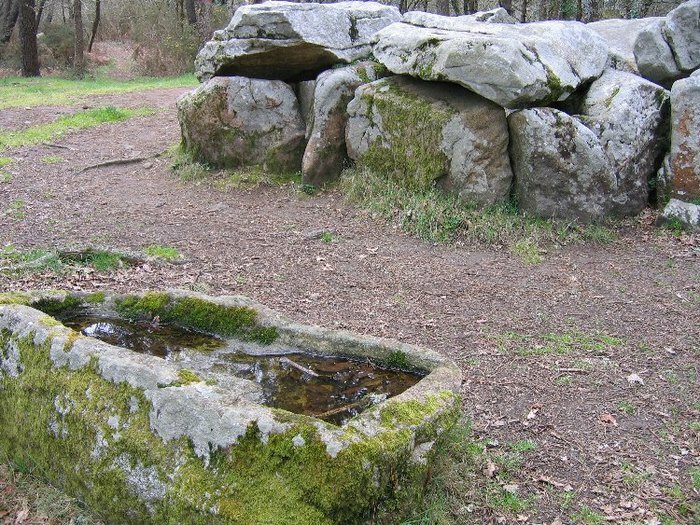 It seems that the ancient builders in Brittany, unlike their contemporaries at the Black Sea coast of the Caucasus, who used to build small houses from the processed and carefully adjusted equal plates without cracks and with a round entrance, were not at all concerned with any aesthetics. Some dolmens do not have any walls and therefore remind tables. A massive roof plate is established only on 3 or 4 stones which are carrying out the function of supporting elements (a photo …). There is not much space between them, but a few people can stand (sit?) there. 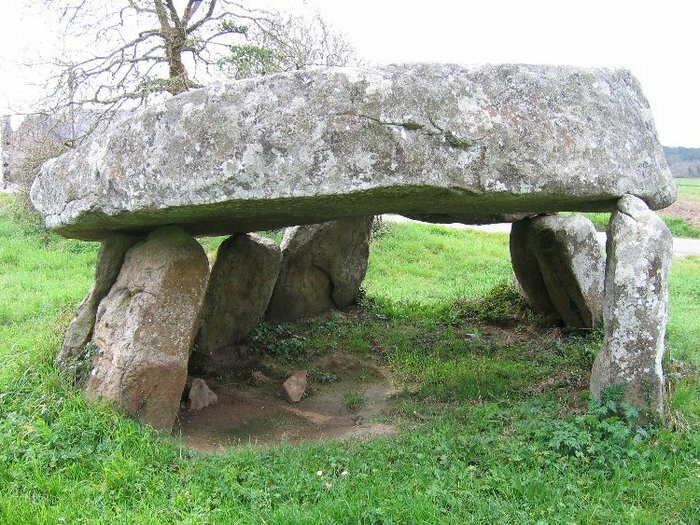 There are dolmens in which plates are established in the form of a Greek letter «Λ», but in vicinity of Carnac I have not seen such. Material used for blocks is, as a rule, local granites. 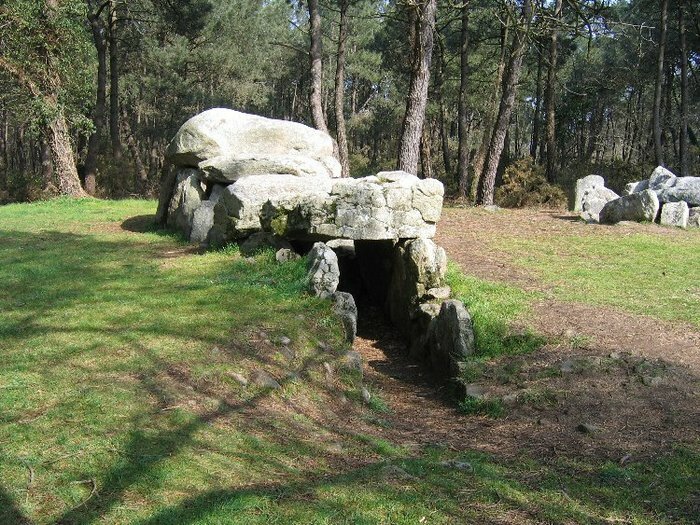 Along with simple table-like dolmens, the dolmens of gallery access or corridor-type dolmens are widely spread in Brittany as well. Sometimes at the bottom, they are partially laid with smaller stones and soil, which gives the impression that they were embedded in the tops of hills (Figure 2.1). In plan, a dolmen usually looks like a bottle. The most distant part − the chamber − is a little bigger and higher. A narrow and low corridor leads to it. A modern man has to bend when being inside of it. The floor in dolmen always has a slight inclination to the exit and is often covered by stone plates. Occasionally one can find dolmens with a few chambers. Such design is obtained due to dividing a big last chamber by dividing walls made of stone plates. Orientation of dolmens is not strict but has some priorities. Most of their entrances are oriented towards the east, the rest are oriented towards the southeast and the south. 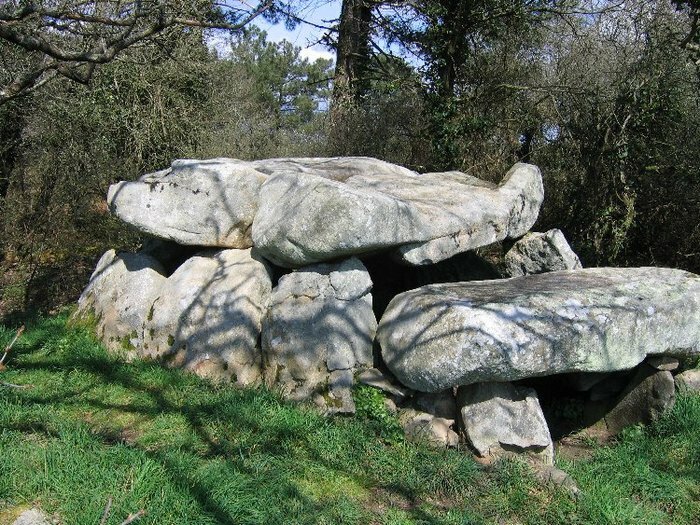 Dolmens are usually located on small heights or hills, on the outcrops of granites or near them. Nowadays the prevailing point of view is that dolmens are gravestone constructions. Domestic items, ornaments and even human remains were sometimes found there during archeological excavations. However, like in the case of with the greatest Egyptian pyramids, it is not clear whether they were originally intended for this purpose or stated to be used for this purpose later. It is also possible that this was not their main purpose. My doubts are caused primarly by the fact that they are constructed too carelessly, as if they were made not by people, but by some mythical giants. Even for economic constructions such quality seems unacceptable, even more so for ritual constructions created for some high, celestial purposes. It is not clear how such gravestones can carry out their main function − to protect remains from breaking in, in fact both an animal and a man could come in through open entrance or cracks. Besides if settled population had such a strongly developed cult of death, that they constructed such monumental constructions for the dead, apparently, it would be expected, that the constructions should be located near each other − in fact in «the afterlife the souls of the dead should communicate with each other». Hence, the appearance of cemeteries − «the cities of the dead», and the whole history of the humanity can serve as an example. However, in Brittany we do not observe such tendency. Single dolmens, rarely pairs of dolmens are scattered over vast territory; by the way they look as well as by their location at the heights they remind rather defensive works of times of the Second World War, than tombs. In this respect figure 2.5 is interesting. Take note that next to the dolmen there is a stone with a hollowed deepening of a rectangular form. Certainly, one can say that it is an altar, in which sacrificial blood was gathered, but it is also possible to think, that it is a prototype of a launder or a bowl. Similarity to the latter becomes more obvious due to the presence of two tanks: apparently, for pure and dirty dishes. It is a big question whether one needs such accessories at the places of burials. 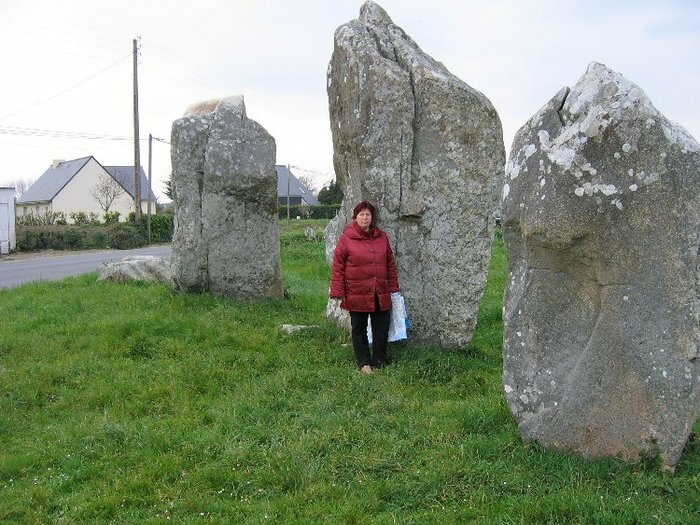 Menhirs are single elongated stones established vertically (Figures 2.6 a, b, c). Their height is usually 3 - 4 meters, sometimes more. The highest menhir is located in the West of Brittany in a place called Plouarzel. It is 9.5 m high. The biggest, but, probably, never standing GrandMenhir lays broken into four parts in village Locmariaquer not far from Carnac (Figure 2.6а). Its original length was 22-23 m and its weight is 280-300 tons. It is considered one of the heaviest blocks, that has been ever moved by people. Figure 2.6а − Big broken menhir in Locmariaquer village. 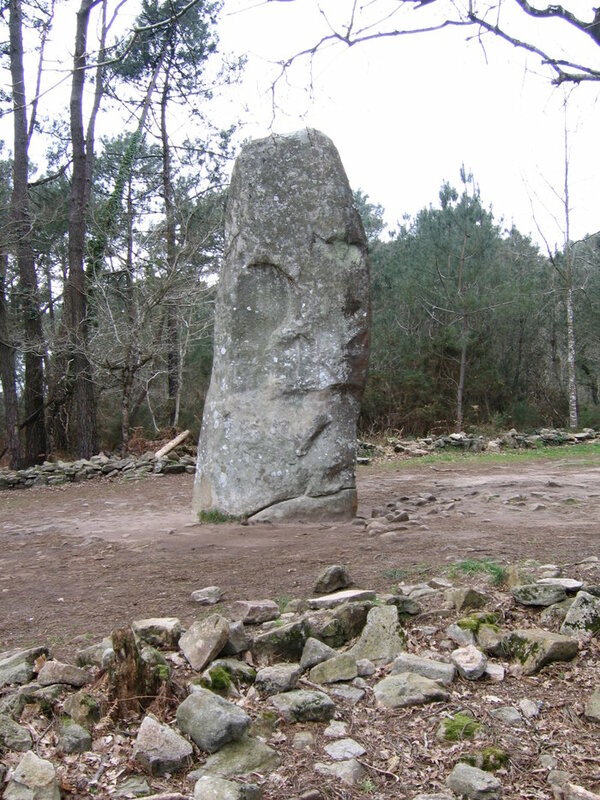 Figure 2.6b − Menhir le Geant du Manio. 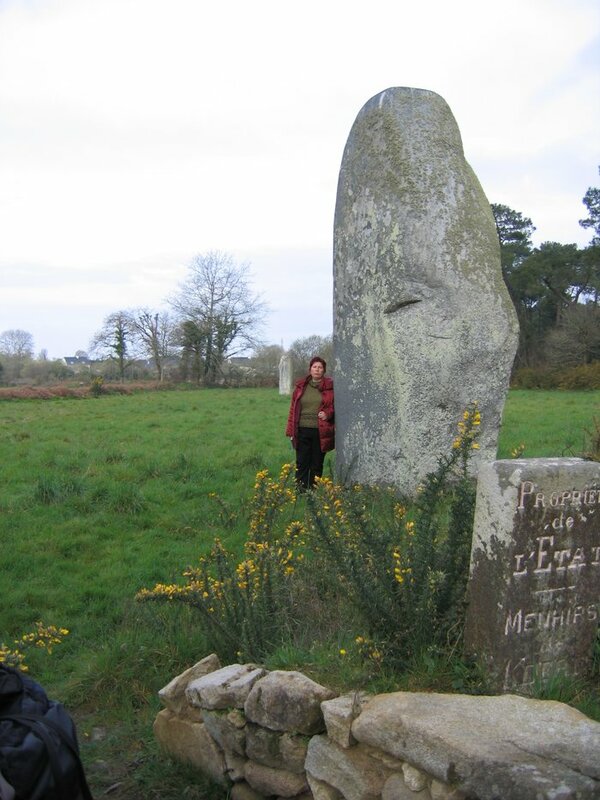 Figure 2.6c − Two menhirs not far from St.-Michel abbey (my wife between them). Menhirs were usually established the same way as dolmens − on some elevated places, therefore they are frequently found close to dolmens. They were some simply set in the ground. The hole, in which a menhir was bedded, was made bigger, and all its remained space was densely filled with small stones and soil. It essentially reinforced a menhir. 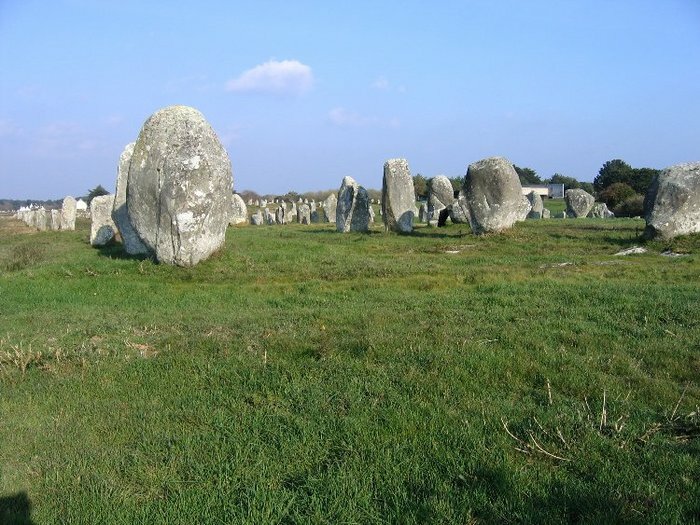 Menhirs do not have distinct traces of processing, but some of them, especially near Carnac where granites are not characterized by special strength, menhirs have uncharacteristic for pieces broken away from a monolith round shape. They remind sugar candies, and are often narrowing towards the top. It can be seen even in the figure 2.6. It is hard to believe, that this happened only because of insolation, influence of water, frosts and primitive vegetation. Probably, before installation the blocks were exposed to some processing, for example – by fire. A stone could be surrounded by brushwood, which was set on fire. In places of overheating of the block, some pieces were chipped from the surface. The shape of these pieces reminded a shell. Blistered cleavages are found here and there (NB – in the advanced processing of granite fire is widely used even nowadays, being one of the cheapest and productive; among the imperfections of this method is that in case of uneven heating a stone sometimes breaks). By virtue of the natural causes, pricked blocks usually have some flattening. In all cases, that I could see, this flattening on a menhir is always meridian pointed − along the north-south line and it is certainly not accidental. It can be determined only "by sight", with accuracy of about 10-20°, but apparently it was enough for ancient people. Their low navigating demands are confirmed by the absence of any manufactured "aiming" areas with precise orientation on the corners of the earth. There are no points at the tops for exact sighting. However, in fact these are devices, which could have been made very easily if it was necessary. 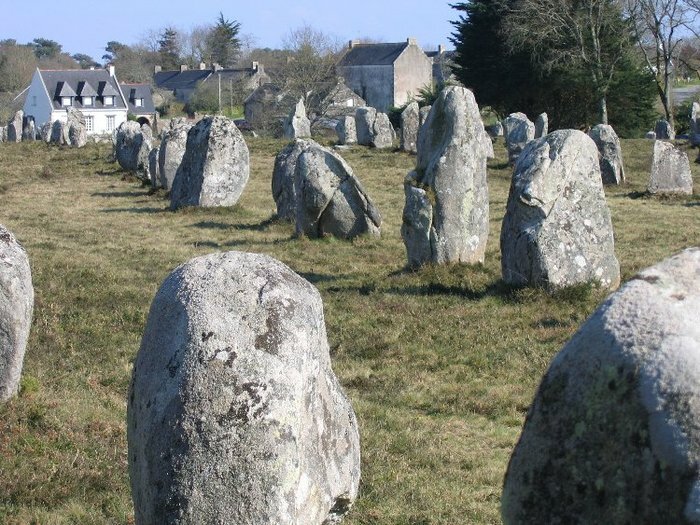 Nowadays the majority of researchers find that menhirs represent the elements of astronomical complexes dispersed in big territory for observing the movements of stars and predictions. It is unlikely so because they usually stand separately. In fact, the simplest way for fixation of any important directions demands the presence of a pair. 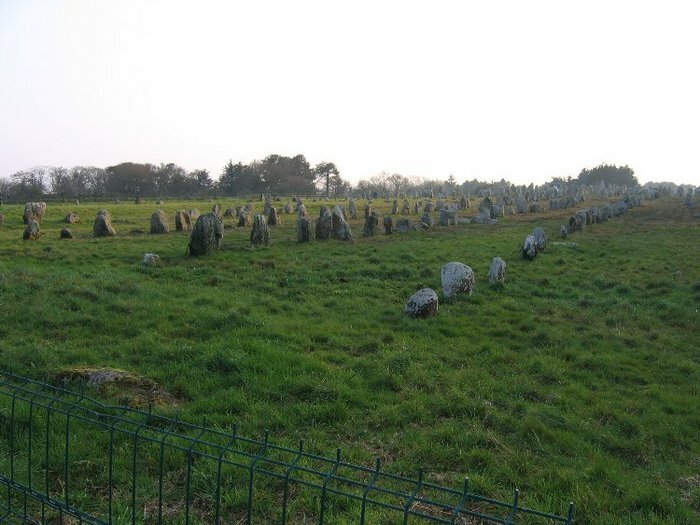 Another weak point of this version is that menhirs are very often located in the woods, from where it is impossible or very inconvenient to observe celestial bodies and neighboring stones. This situation made its authors to assume, that ancient farmers who, in the opinion of scientists, occupied these places, had to cut down the forest around for improvement of the view. This explanation, along with a supposed destruction of the woods by farmers for expansion of the arable areas was used as one of the principal causes explaining an unclear (for researchers) deficiency of pollen of lignosa in sporule-pollen spectra of the adjournments of that period. There is also another point of view, that menhirs are memorial steles, since near some of them the traces of burial places have been found out. Alignments are the biggest, the most complicated and mysterious objects (Figures 2.7 - 2.10). They represent sets of vertically established stone blocks organized in parallel lines. The number of such lines in the biggest alignments reaches 10-12 pieces. Their extent varies from a couple hundred meters up to 1 km. 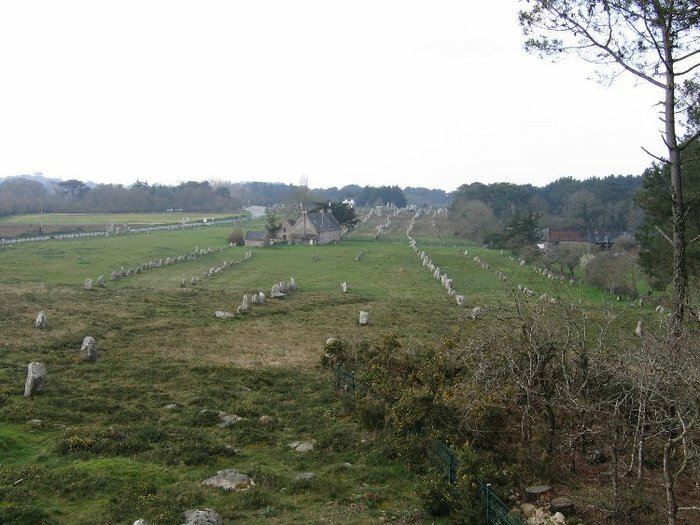 The total number of blocks in the alignments in Carnac is little less than 3000 pieces; their total weight is a few thousands tons. The constructions look so impressively and remind the creations of giants, rather than ordinary people, that they deserve the name of «Hercules columns» in a much greater degree than Gibraltar. In this case, it would sound much less metaphorical. Near Carnac, there are six such sites. Four of them: Le Menec, Kermario, Kerlescan and Petit Menec are located a little to the north of it, and are built with intervals in the same direction having approximately NE-SW run. The fifth one that is located 10 km to the West, at the small town Erdeven, has a latitudinal run. The sixth one is near a small town Plouharnel in St. Barbe village. It differs from all others being oriented from SE to NW. The largest blocks in the alignments have height up to 3.5-4 m and weight up to 30 tons. 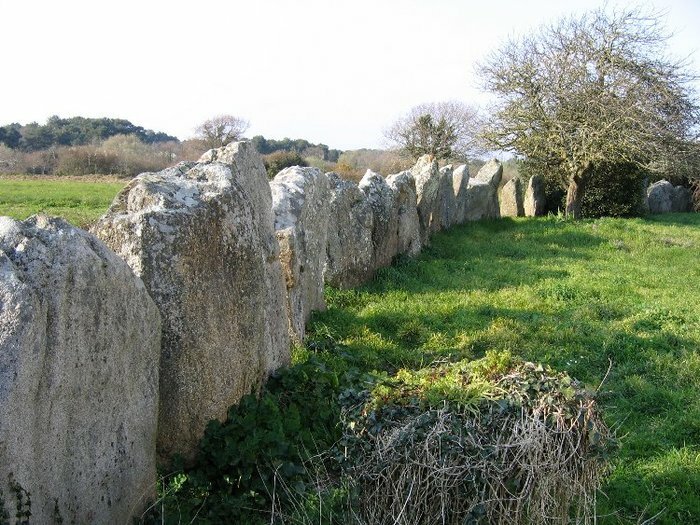 The distance between stones in the lines is not constant: the larger the stones the farther they are usually removed from each other and vice-versa. The largest blocks are established near the outcrops of hard rocks. Their height systematically decreases in the direction of the relief lowering. Often, but not always, this takes place in the direction from the West to the East. The lines, along which they are located, are far from ideal (see a photo) and when I say "parallel" it should not be taken literally. Sometimes they approach, and sometimes fan, as on the site Kerlescan. On the site Petit Menec, blocks are established in 2-3 alignments along a big mildly sloping arch. Figure 2.7 − Kermario alignments. A view in the SW direction. Figure 2.8 − The western flank of le Menec alignments. The height of a stone in the foreground is about 3 m. A view to the East. Figure 2.9а – Kerlescan Alignments. A view to the East. Figure 2.9b − Upper part of Kerzerho alignments located at Erdeven. . Figure 2.9c − Kermario alignments. A view to the western flank from a viewing tower. Stones along the lines are not always established precisely either. Occasionally some of them stand with a significant deviation from general spreading to the right or to the left, and sometimes on big intervals, they disappear altogether. Therefore, it is possible to speak about a regularity of alignments only to a first approximation. As it can be seen in figures 2.9 and 2.10. Blocks in the alignments, as well as menhirs are established in holes, filled for strengthening by finer stones and soil. Let us note another important thing for the subsequent conclusions – there is no cross organization of blocks in the alignments. A certain economical version of alignments is presented, in my opinion, by groups of menhirs not organized along the lines. 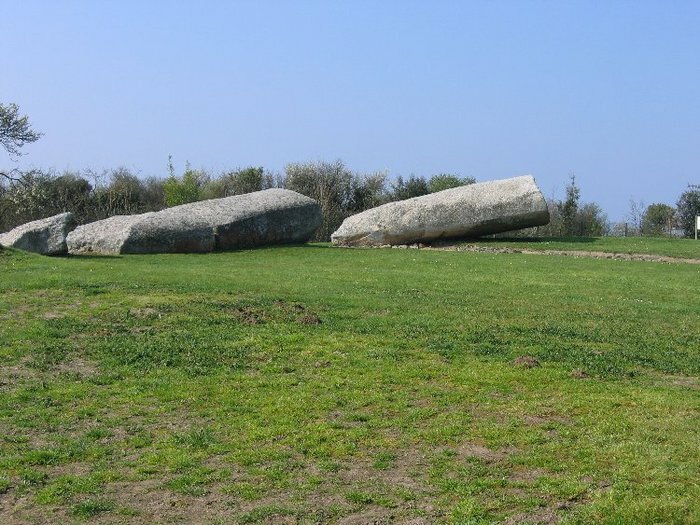 In the area of Carnac, it is so-called «Champ de menhirs», and beyond it, there is a well-known group of Almendres in Portugal (Figure 2.11). 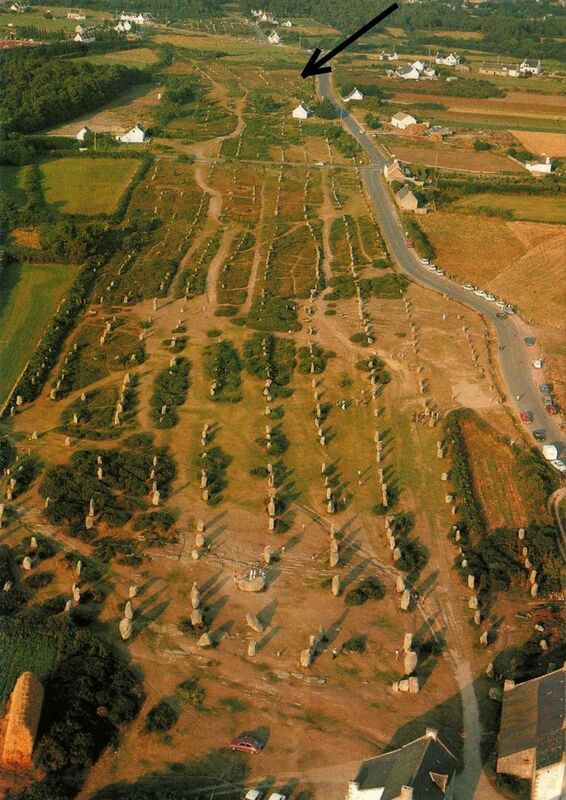 Figure 2.11 – A group of menhirs Almendres (near Evora) in Portugal. Altitude above the sea level is more than 400 m. Photo taken by N. Kolobkova. From flanks alignments often end by cromlechs, but not all of them are preserved. These constructions represent stones established in circles. Near Carnac they, while forming some kind of end cap, fully or partly close an entrance into the alignments from the end. 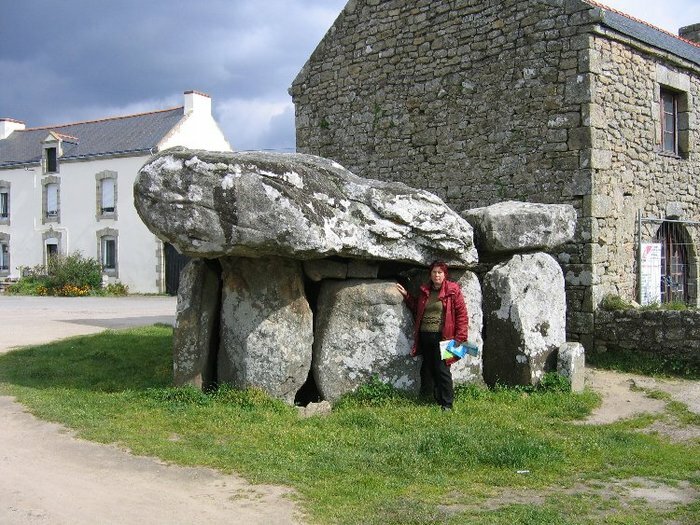 The best preserved is the cromlech on the western extremity of Le Menec alignments. There the plates of about one and a half meters high are set so densely that they form something similar to a wall (see Figure 2.12). Meanwhile on Kerlescan site something similar to a cromlech is presented only by separately standing groups of stones. The form of cromlechs as well as the alignments is far from an ideal. One can compare it to any mathematical figures – a circle or an oval − only with a big allowance. Modern researchers when speaking about the purpose of the alignments do not offer us anything better than to consider them as peculiar temples for the sun worship, arranged not edgeways but broadways. The platforms limited by cromlechs on the ends are considered as some peculiar altars and the alignments themselves – as paths, along which processions headed by priests, probably, should have walked. This version is made to sound more “scientistic” by the conclusions of some scientists. Some substantiate even the curvatures of the lines, seeing in them a hint to the image of the snake − the symbol of wisdom, which also specifies the cyclicity of natural processes. Others point to the distance between the blocks. From this distance they calculate the precise (up to millimerters) measure of length − so-called Neolithic yard, which ancient builders supposedly used at their construction. 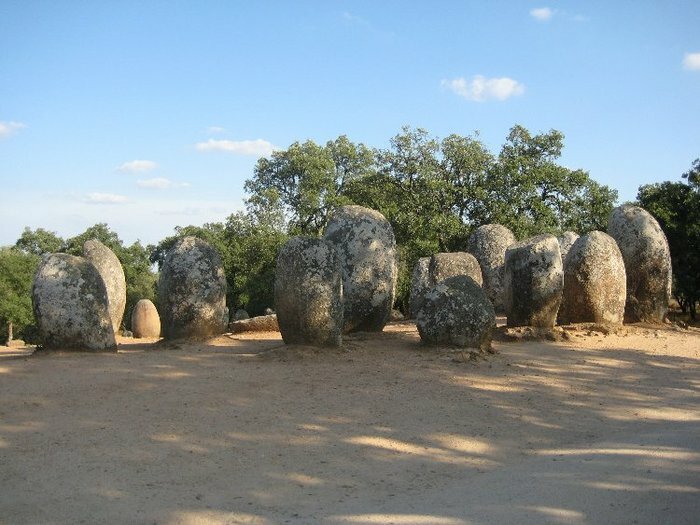 In the cromlechs’ outlines, they see a combination of precise geometrical figures, advancing an idea that each stone has been established not accidentally, but on the specific place in strict conformity with some general mathematically verified system. The third ones «are aiming» the alignments towards the sunrise or the sunset on some critical days (for example, equinoxes, or of winter or summer solstice). Figure 2.12 − The fragment of a cromlech’s wall on the western extremity of le Menec alignments. (It is not in the aerial photograph 2.10 because it is located a little below the bottom border of the picture). The main argument put in the foundation of such "ritually-astronomical" versions is that alignments though not precisely and not always, but stretch in the direction that is close to latitudinal - between the East and the West, and one cannot help assuming that they are connected with rising or setting of the sun?! This position is almost no losing – it is difficult to overestimate the role of the sun in people’s life at all times. The temptation to hold such version becomes even stronger if we consider the modern views of scientists that back then the first farmers-cultivators ostensibly settled in this area of Brittany, and if so, for them especially the sun should have been everything. Nevertheless, the true reasons, in my opinion, why the alignments are being attributed such strange function, are different. Firstly, the true reasons are absolute absence of any others, more adequate explanations of this phenomenon. Moreover, when researchers have difficulty in defining the purpose of an object, they often cannot resist the temptation of connecting it to some ritual or a cult, since not everything that has to do with beliefs demands a rational explanation. Secondly, the reasons are in fashionable falling over the things that have to do wth so-called «disappeared civilizations». The admirers of this view assume that ancient people possessed some supernatural knowledge of the space and the universe, and that for reception of forecasts and predictions their leaders and priests forced people to erect different constructions that remain unclear even to us now. Moreover, thirdly, majority of people perceive an antiquity as a certain gloomy epoch where everything was determined not so much by common sense and rationalism, but by prejudices and rituals, and that ancient people by virtue of their backwardness were like zombie worshipping their horrible gods at any cost. Besides the alignments, another well known example of such errors is the Stonehenge. These constructions are put together because they have constructive similarities. At their erection, people used not large, but small blocks, suitable for moving by one person. They were stacked upon each other without any cementing material − «of drystone». The difference between these constructions consists in their form. Tumulus usually has round outlines in plan and is built on basis of a corridor dolmen by the way of surrounding it by stones from all sides except for the entrance. 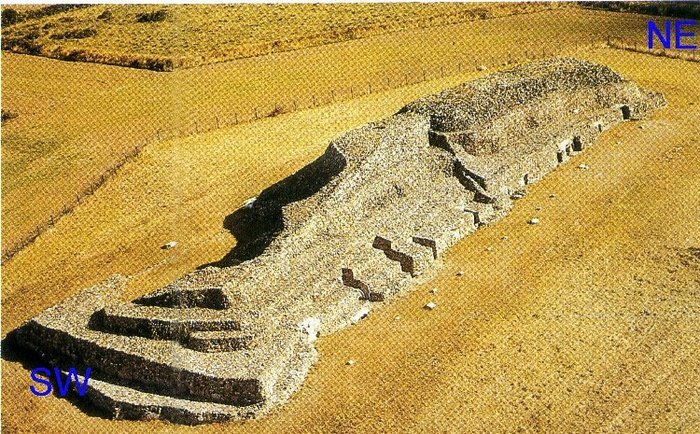 However, a baralignment represents a prolonged barrow with a flat top, completely made of stones. The slopes of both tumuli and barrows often have step character like ziggurats (Figure 2.13, 2.14). Figure 2.13 − Tumulus «TabledesMarshand», village Locmariaquer. The length of the barrows is usually some tens meters, and the height is from 1 up to 6-7 meters. The size of tumulus can also reach several meters in height and some tens of meters across. 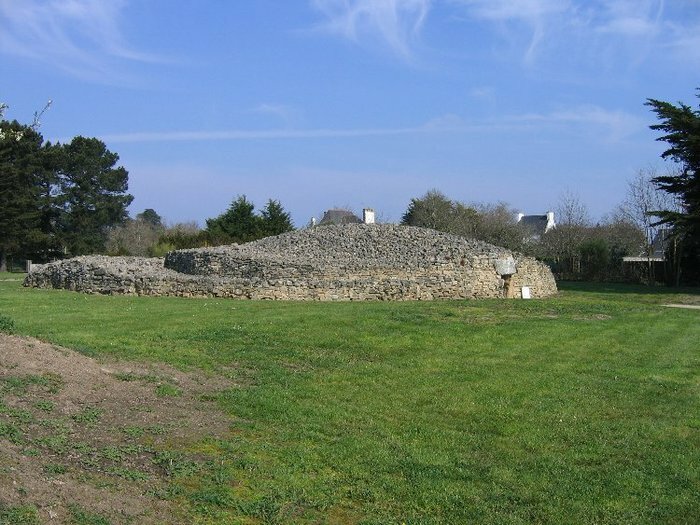 The biggest of them, being somewhat an average between a tumulus and a barrow, is located in the north of Brittany on the coast in the place called Barnenez (Figure 2.14). Its length is 90 m, width – 40 m and height - 6-7 m. By its arc-like form with front facing the ocean, and by its location across the gulf it slightly reminds a coastal fortress. About 14 thousand tons of stones were used to build it! From the Southeast (rear) side there are entrances into 11 of corridor dolmens in it. Figure 2.14 – Tumulus-barrow Barnenez. (Cairn Barnenez). The North of Brittany. An aerial photograph from the book “Standing Stones” by Jean-Pierre Mohen published by Thames and Hudson. In some barrows, for example St. Mishel (Carnac), d'Er Vingle and Mane Lud (Locmariaqer), chambers with the remains of burials have been found. On the surface of a small barrow on Kerlescan site, there were numerous parts of furnaces, fragments of pottery, etc. Tumuli and barrows, as well as dolmens are nowadays considered gravestone constructions for all the same reasons. In the conclusion of this chapter, I would like to note, that the condition of Megaliths before the first systematic researches that begun in the nineteenth and continued in the twentieth century, was catastrophic. Many tumuli and barrows were ”undressed" – the inhabitants of the nearest villages used to take away small and big stones, from which they constructed their houses and roads. In the NW board of Barnenez tumulus before the war there had been a mine organized. Add to this destructions from the thieves purposefully collecting objects of an antiquity, nonprofessional excavation carried by amateurs who were also numerous, and early Christian fanatics’ struggle against «devil stones», and you will understand what fragmentary, difficult for studying and generalizations material appeared at the disposal of archeologists. Prosper Merimee being an «inspector of historical monuments and national antiquities» visited the area of Carnac and published in 1836 «The notes about travels in the West of France» (Notes d'un voyage dans l'Ouest de la France). In a great measure the voyage was devoted to estimations of the condition of medieval churches, but the megaliths were not forgotten either. It is very interesting to compare what Merimee saw and what remained there now. Informing about a pitiable (already then!) condition of monuments he writes: «Oldbies of Carnac and Auray assured me, that … for the last years only in the vicinities of Carnac more than two thousands of them [megaliths] have been destroyed…». If one adds to it that, which disappeared afterwards, the remaining megaliths would hardly make a half of the original number. Many monuments, in that well-groomed condition that we observe them are substantially created anew. Therefore, arguing about their features I had to be very cautious − the probability of "wrong restoration of their details» in the process of restoration at the absence of understanding of their purpose was too great.